J. Cremer & Co., John A. McAllister, ca. 1860. 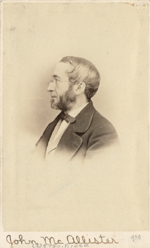 Albumen on carte de visite mount. In 1886 Philadelphia antiquarian John A. McAllister (1822-1896) presented his collection of Civil War era printed ephemera, graphics, and manuscripts to the Library Company. With over 50,000 items, it was probably the largest ephemera collection of its time. For over a hundred years access to it has been limited, but now thanks to generous support from the National Endowment for the Humanities and the William Penn Foundation, it has finally been conserved and cataloged. This page is a brief overview of the collection, with links to more detailed descriptions and to the finding aids and catalog records that provide access to its various parts. The John A. McAllister Collection is as massive as it is diverse. At its core are tens of thousands of examples of printed ephemera, most from the Civil War years, including ca. 600 recruiting posters, as well as newspapers, political broadside and leaflets, tickets, trade cards, cartoons, and a complement of ribbons, buttons and other ephemeral items constituting the largest such collection documenting the Philadelphia home front. But there is much more than just the war. Over 650 Comic Valentines satirize every conceivable ethnic, occupational, and personality type. About 5,800 song sheets ranging from the 1840s to the 1870s disseminated lyrics to popular songs on a variety of topical the mes. Some 5,800 playbills cover the theatres of Philadelphia and its hinterland from the early 19th century to about 1870. In addition to printed ephemera, the McAllister gift to the Library Company included some 1,200 volumes of 18th and 19th century books and pamphlets on a wide range of subjects. These are individually cataloged and are available in WolfPAC, the Library Company’s online catalog. P.S. 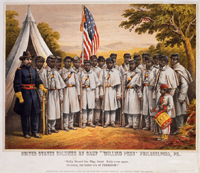 Duval & Son, United States Soldiers at Camp "William Penn" Philadelphia, PA:"Rally Round the Flag, Boys! 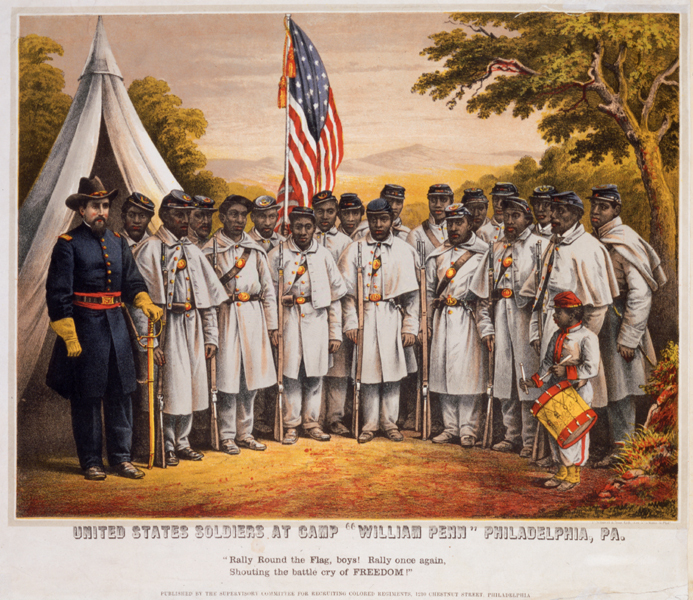 Rally Once Again, Shouting the Battle Cry of Freedom" (Philadelphia: Published by the Supervisory Committee for Recruiting Colored Regiments, 1210 Chestnut Street), 1863. Chromolithograph with hand-coloring. The collection of graphic items is no less massive, including lithographs, engravings, cartoons, maps, textiles, drawings, photographs, and about 7,000 patriotic pictorial envelopes. The most important component of the collection is early Philadelphia photographs. The McAllisters were active in the development of photography in America, and the McAllister photograph collection comprises the backbone of our renowned collection of 19th century photographic Philadelphiana. In addition to these well-defined genres of ephemera, the collection contains sixteen discrete subject-based Mixed Media Collections. Nine of these are related to the Civil War, including sanitary fairs, voluntary saloons and hospitals, generals and leaders, playing cards, verse, and Confederate States ephemera. Three collections contain political ephemera, including Salt River cartoons, named for the figurative river up which defeated candidates were sent by the voters. Four others contain miscellaneous social and cultural materials, including more than 3,000 lottery tickets. Even broader in scope are the 93 boxes (39.41 linear feet) of manuscripts. John A. McAllister (perhaps with help from his father John McAllister Jr., 1786-1877) collected business records and correspondence from many local firms and banks (including the Bank of the United States, 1790-1842), assorted family collections, records of the Pennsylvania General Assembly (including petitions submitted to that body, 1790-1838), miscellaneous manuscripts ranging in date from 1683-1872, and his own personal papers. This collection is an invaluable resource for the study of Philadelphia business and life over the course of a century. Click here for links to other related resources on the Civil War and Philadelphia history. Any views, findings, conclusions, or recommendations expressed on this web page or its accompanying documents do not necessarily represent those of the National Endowment for the Humanities.